What Did Adam Look like? We live in a fortunate time. Advances in the science of genomics now makes it possible to look back sixty thousand years and see what the founding father of our family really looked like. Sixty thousand years ago a man lived in what is now Ethiopia. Every man alive today carries his Y chromosome. There are a people today that are almost unchanged genetically from this early man. They are the San people of the Kalahari Desert. When we look at them we can see ourselves in them. If you want to know what Adam looked like take a look at the enclosed picture. He looks much like the father of us all must have looked. 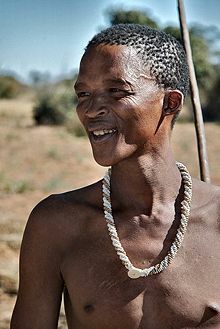 Your are correct, the San are the bush men of the Kalahari desert. They are representative of our ancestors because their genes are almost identical. Fore a starting point watch this video. http://www.youtube.com/watch?v=OV6A8oGtPc4 I would also highly recommended the book, "Before the Dawn: Recovering the Lost History of Our Ancestors" by Nicholas Wade. While science has made leaps and bounds looking at some bones found doesn't tell us the whole scope of humanity its like flicking a lighter in an unlit auditorium. Every discovery leads to more theories which negates the last ones and more often than not just more questions. Genomics is not looking at some old bones. It is reading the story that each and every one of us carries in our cells. While it can not tell us the whole scope of humanity it can tell us where we came from and who we are. Still nothing more than theory and conjecture and as is with all things the truth is probably in the middle of the speculation or yet to be discovered. If it only theory and conjecture what is your alternative explanation as to why all men have the same Y chromosome that can be dated back sixty-thousand to one man. This is not theory, it is an established fact. From a purely scientific stand point there was only one genetic Adam, not many. What you are is determined by your genes. You are descended from that one Adam who lived sixty thousand years ago. There is only one Y chromosome existent in the human species today so there was only one Adam and we are all his decedents. "there was only one genetic Adam, not many." if there was only one human from where did he originated??? and whom did he marry?? we have evolved in large numbers, i think. You misunderstand. No one is saying that there was only one human. What is a fact is that sixty-thousand years ago there was one man who for whatever reason had a Y chromosome that dominated the human species. At that time there was a rather large die off and the human species almost became extinct. This probably was a contributing factor.